Headlight restoration is a procedure done by a detailing professional to remove scratches and cloudy yellow oxidation from the headlamp lenses. The discoloration is caused by exposure to ultraviolet light and can restrict the amount of visibility while driving at night. It can also greatly reduce the value of your automobile or RV. During the procedure the headlamp bulbs are not disturbed while the headlight lenses are sanded and polished to perfection. At Pinehurst Mobile Detailing we use a patented process created by bright solutions that seals the newly restored look for years. This product is the highest of quality and can be done in most any climate. The lamp is first cleaned with a solution to prepare it for an AIM 2000 headlamp intensity meter. Once the verification is done we can decide what grit # sand paper to use and begin removing the oxidation. Then we polish with shine restorer and your old cloudy lenses are once again showroom quality. This restoration process is by far the least expensive way to correct the problem. 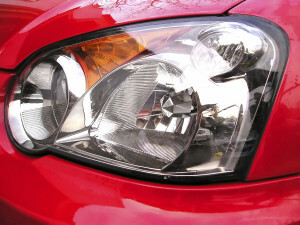 New auto headlight lenses can cost $500 or even more depending on the make and model of the automobile.